“Last summer I almost died in my quest for love. I wanted to visit my usual singles bar. Two summers ago, I saw a pretty girl there but she gave me the cold fin. So I was going along with my buddies, following the reef, when we stopped in a cave to rest for a while. There was a powerful current taking us deeper into the cave. We couldn’t fight it. After smashing our bodies along the strange cave, we ended up in a canal. We tried really hard to get back to the ocean but we were trapped. Many jellyfish came along the same cave and ended up in the canal. A few days later, the water started to smell bad, it was impossible to breath, and the jellyfish stung our eyes, and scarred our faces There were so many of us tapped in that hell. The events explained here are based on a true story. On August 22-25, 2011, a massive influx of jellyfish shut down the St. Lucie nuclear power plant in Fort Pierce, Florida. 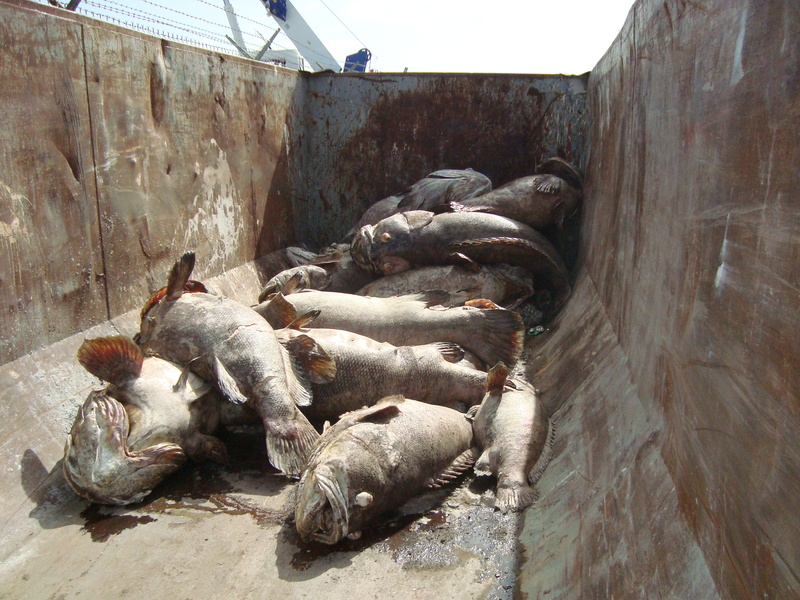 As a collateral damage, the event resulted in a massive kill of protected goliath groupers already trapped in the plant’s water intake canal. Early estimates are around 50-75 adult goliath groupers but they could be higher. Considering the species is critically endangered throughout the Atlantic ocean, and in the United States it’s in a slow path towards recovery from near extinction, losing such a significant number of the breeding population is a major setback towards recovery. An article at the Palm Beach Post reported the entire incident. The nuclear power plant intake pipes, located 21 feet deep, 1,200 feet offshore Fort Pierce (two pipes 12 feet in diameter each, 1 pipe 16 feet in diameter) are in line with a series of worm reefs heavily used by marine wildlife from seaturtles to manatees, reef fishes and goliath groupers. Lacking proper screens, the pipes regularly suction passing marine wildlife. Once trapped, they cannot escape and return to the ocean. Seaturtles are periodically collected and released free. But the same is not always done with the trapped goliath groupers. All seaturtle species and goliath groupers are protected under federal and state regulations. Why release one group and not the other? Once the groupers are trapped in the canals, they are lost to the population, because they’ll never be able to reach a spawning aggregation and reproduce. Scientists (including myself) were outraged at the massive fish kill because it could have been prevented, and we contacted the Florida Fish & Wildlife Conservation Commission (FWC) and the National Oceanic and Atmospheric Administration (NOAA) proposing an improved contingency plan to avoid further fish mortalities. This action resulted in a new FWC protocol during fish kills. But as we approach the 1 year anniversary of the nuclear fish kill, I don’t see the changes I expected. Without any major changes in the intake pipes, seasonal swarms of jellyfish might force again to shut down the nuclear reactor. 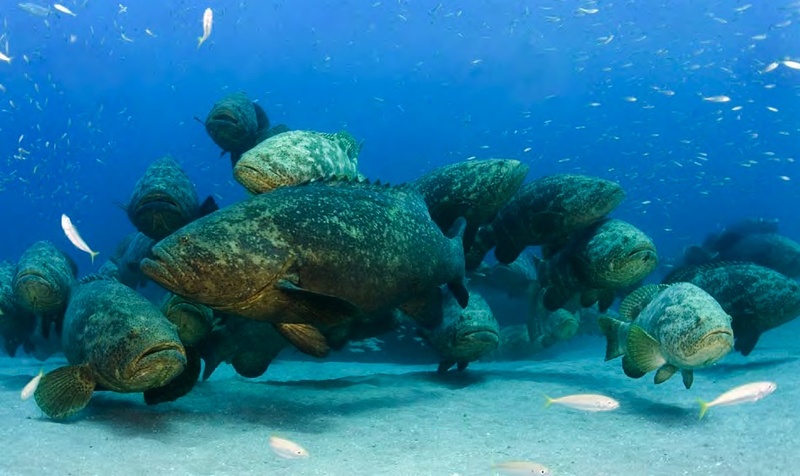 And without periodic releases of trapped marine wildlife back into the ocean, death by nuclear reactor is still a reality for the protected goliath groupers of Florida. Blog Grouper Luna by Dr. Sarah Frias-Torres is licensed under a Creative Commons Attribution-NonCommercial-NoDerivs 3.0 Unported License.